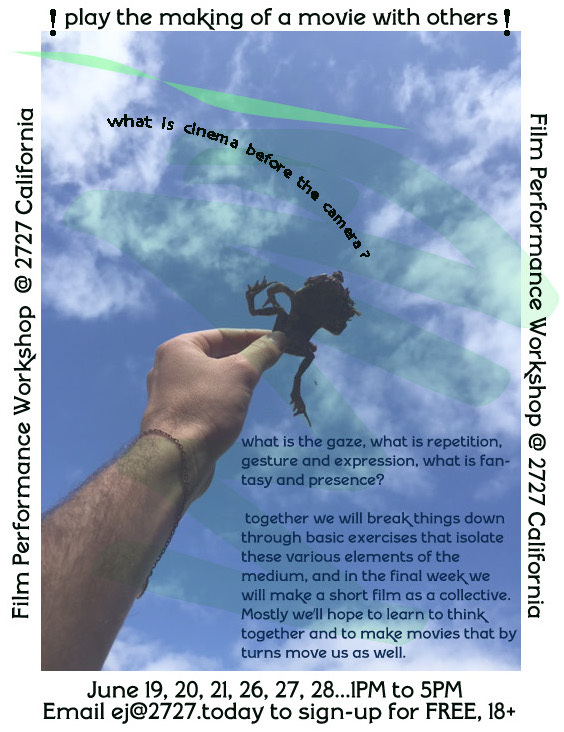 In this two week filmmaking workshop at 2727 California, an arts education and residency program in Berkeley, Calfornia, we will explore together the components of movie making, the technologies, yes, but perhaps more importantly, what are the basic building blocks of cinema as such, before the camera. This is an open question, and together we will ask and perform what is the gaze, what is repetition, gesture and expression, what is fantasy and presence. Over the course of six classes we will break things down through basic exercises that isolate these various elements of the medium, and in the final week we will make a short film as a collective and then have a screening at 2727 California. Mostly we hope to learn to think together and to make movies that by turns move us as well. A lot can happen in a day—especially the day Jesus died. Between fantasizing about Pastor Ellen, getting her braces off, fighting over an Easter ham, and making out with a girl in the organ loft, fourteen-year-old Ingrid spends Good Friday wandering Brooklyn, contemplating her sexual and spiritual identity.